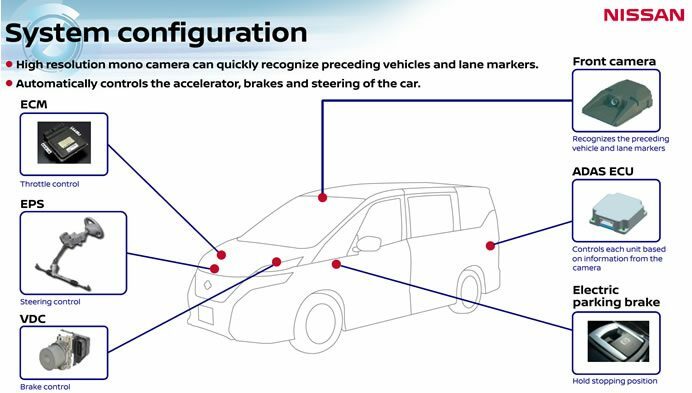 Nissan’s new Serena minivan, scheduled to go on sale in Japan in late August will come equipped with Nissan’s ProPILOT autonomous drive technology. The ProPilot will be the first auto-driving system to be offered by a Japanese automaker. ProPILOT is a revolutionary autonomous drive technology designed for highway use in single-lane traffic. Nissan is the first Japanese automaker to introduce a combination of steering, accelerator and braking that can be operated in full automatic mode, easing driver workload in heavy highway traffic and long commutes. Employing advanced image-processing technology, the car’s ProPILOT system understands road and traffic situations and executes precise steering enabling the vehicle to perform naturally. ProPILOT technology is extremely user-friendly, thanks to a switch on the steering wheel that allows the driver to easily activate and deactivate the system. ProPILOT’s easy-to-understand and fit-to-drive interface includes a personal display showing the operating status. The accelerator, brakes and steering are controlled based on information obtained through a mono camera equipped with advanced-image processing software. The ProPILOT camera can quickly recognize in three-dimensional depth both preceding vehicles and lane markers. Once activated, ProPILOT automatically controls the distance between the vehicle and the preceding vehicle, using a speed preset by the driver (between approximately 30 km/h and 100 km/h). The system also keeps the car in the middle of the highway lane by reading lane markers and controlling steering, even through curves. If a car in front stops of the new Serena minivan, the ProPILOT system automatically applies the brakes to bring the vehicle to a full stop. After coming to a full stop, the vehicle will remain in place even if the driver’s foot is off the brake pedal. When ready to resume driving, ProPILOT is activated when the driver touches the switch again or lightly presses the accelerator. 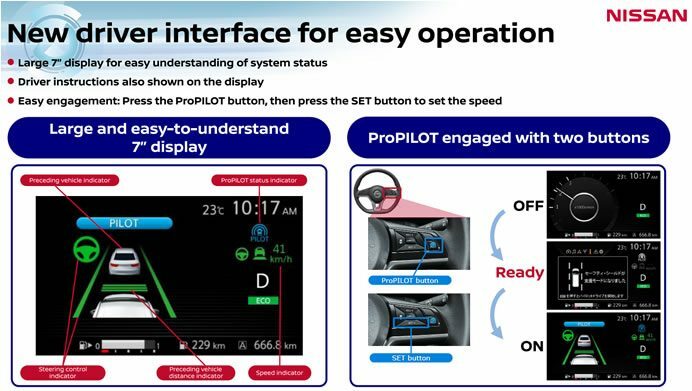 Nissan is carrying out intensive studies of driving conditions in various regions so that ProPILOT will be well suited to the conditions in the markets in which it will be launched.